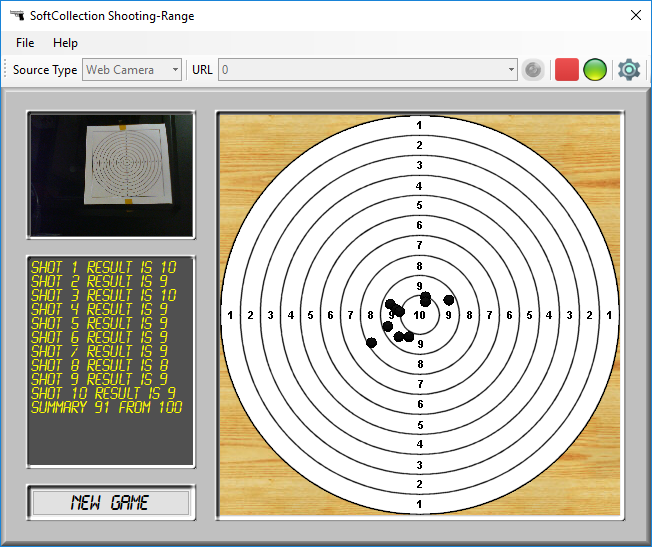 SoftCollection Shooting-Range is a shooting training game. All you need is PC, Web Camera or IP Camera and Laser Gun that emits laser beam for 100 milliseconds. If you don’t have such gun, you can use simulator in order to see how the game works. First of all you have to print the target. Desired PDF file can be found in Help/Print Target menu. (RTSP Camera/Web Camera/Simulator). When Source Type is selected, select URL for your device. green – you are connected. Click New Game button and play the game. * Supports RTSP Cameras and Web Cameras. * Automatically remembers last state. 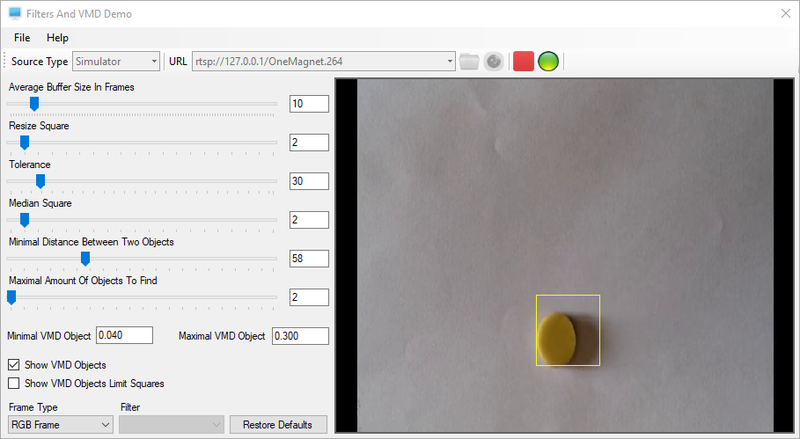 Filters And VMD Demo demonstrates the entire Video Motion Detection process. 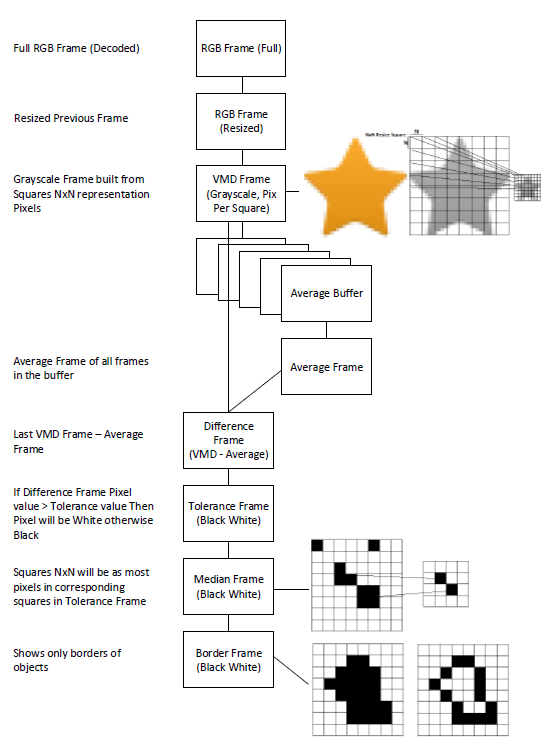 RGB frames that may be to large for VMD so we need to resize them. to resize it quickly. To accomplish this goal we divide the frame into macroblocks NxN. Average VMD Frame of last N VMD Frames. Now we can get Difference Frame. the Tollerance Frame corresponding pixel will have the value of 255, or 0 otherwise. this macroblock. Each macroblock will became a pixel of Median Frame. Now we have all the objects on the frame as spots. We can get only edges of these spots. We can also apply various Filters (Blur, Shapen, Edge) to VMD Frame. when number of Drawing Windows can vary from 1 (1x1) to 36 (6x6). to control these devices from your PC. You can use all devices that are supported by LIRC Project. List of all these devices you can find here. Please remember THERE IS NO GUARANTEE THAT EVERY REMOTE CONTROL WILL WORK. Arduino Nano Board, 200 Ohm resistor and IR Led. Please follow the Arduino LIRC PC Tools User Guide for more detailed explanation. 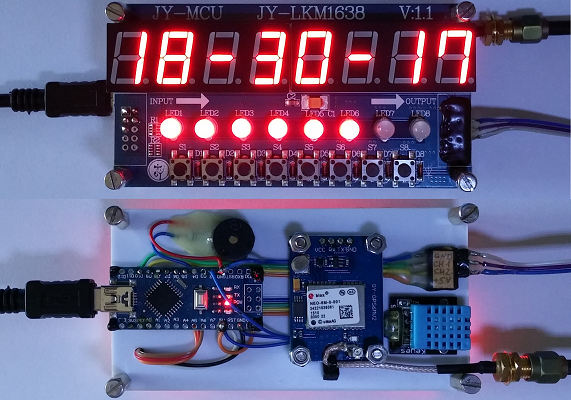 Arduino based GPS LED Digital Clock. Time - Automatically updates from GPS. Date - Automatically updates from GPS. Timer - Measures time up to hundredths of second. Satellites - Shows number of currently visible satellites. Temperature - Shows current temperature. Humidity - Shows current humidity. Anemometer - Shows current wind speed in meters per second. 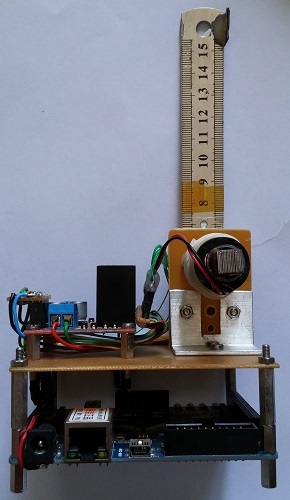 Fantazein Clock, based on NXP LPC-1768 ARM M3 Processor. * You can view Parallel Port state and even change it. Convenient Web TV / Radio Program. * You can easily import, export, save and switch channels. and even change channels via Skype Chat Window. You can watch TV on remote PC or Mobile Device. This Plugin works together with Skype and WinLIRC. Skype allows Video and Audio transmission and sending Remote Control commands via Chat pannel. WinLIRC is a Server that implements Infra-Red Remote Control functionality. Before you buy Capture Device, ensure that it is compatible with Skype! 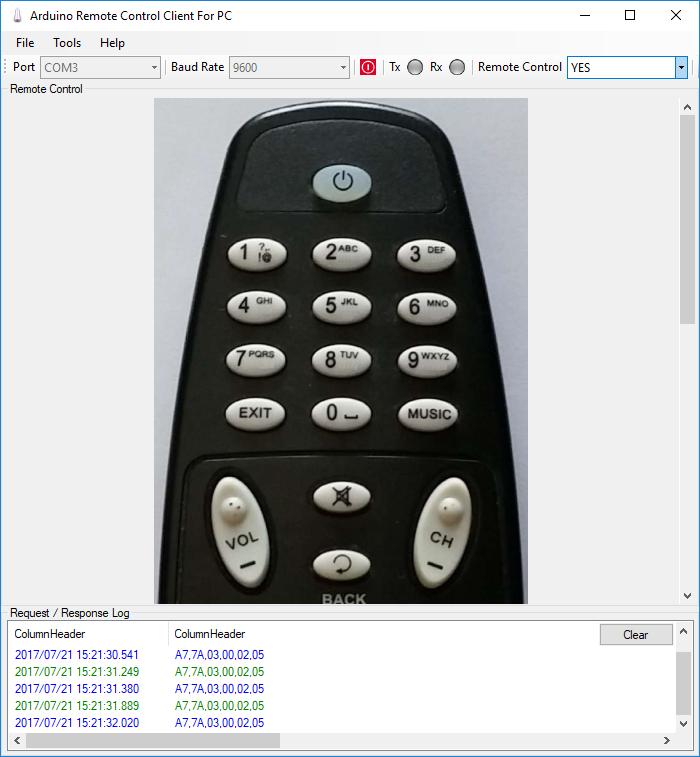 Before you buy Remote Control Device, ensure that it is compatible with WinLIRC 0.8.7a! * Remembers location, size and user preferences. and doesn't need any additional hardware. You can install the system yourself, without professional assistance. reed switch, installed on the door or the window. PLEASE REMEMBER YOU MUST CONNECT EVERYTHING THROUGH A 500 Ohm RESISTOR!!! OTHERWISE YOU MAY CAUSE HARM TO YOUR PC!!! from any video capture device connected to your PC, such as web camera or tv card, and save them to file. desired frames into the video movie. It is also possible to capture single frame to file or clipboard. this library in C#, VB.NET and other programming languages supported by .NET. 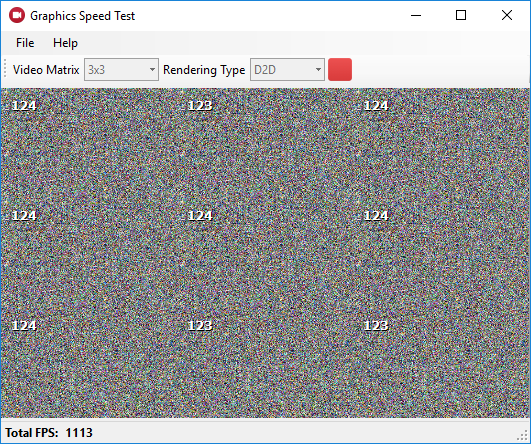 * Supported by .NET 2.0.
that accepts frames, one by one, just as Bitmaps, and can detect moving objects on these frames and enumerate them. density of the object (number of points in the object divided by number of points in the minimal rectangle mentioned above). point be changed to be considered as changed, and set minimal number of points, that differs between real object and noise. You can use this library in C#, VB.NET and other programming languages supported by .NET. SoftCollection Parallel Port Library For .NET lets you a full control over the Parallel Port of your PC. electrical potential from each readable pin of the Parallel Port of your PC. The male-connector, that you connected to your PC Parallel Port's DB-25 female-connector, has 25 pins. 1. Data Pins (2,3,4,5,6,7,8,9). These pins may input (from outside) or output 0V or 5V, depending on the Mode (Read/Write). 2. Status Pins (10,11,12,13,15). These pins are readable only, and may only input 0V or 5V from outside. 3. Control Pins (1,14,16,17). These pins are writable only, and may only output 0V or 5V. Connect a LED through 500 Ohm resistor to every pin, that may output signal (1,2,3,4,5,6,7,8,9,14,16,17). Connect a button through 500 Ohm resistor to every pin, that may input signal from outside (2,3,4,5,6,7,8,9,10,11,12,13,15). and may display an additional information that is undesirable or is impossible to be displayed on the monitor. you can connect an LCD Module to your computer and display on it all the information you need). and has simple interface for controlling all the LCD Module built-in functions. SoftCollection Reversi (Othello) is an implementation of classic Reversi (Othello) game. Lens that magnifies everything on the screen. * It is possible to move lens manually by mouse clicking on it and dragging to another place. * It is possible to make it move straightforward by reflecting from edges. * It is possible also to change size of magnifier. * It is possible to change magnification coefficient from x2 to x10. * It is possible to Hide / Show magnifier. * It is possible to make it Allways on Top. * It is possible to run it on startup. SoftCollection Impulse Counter supports up to 12 counters, counting impulses via parallel port. All you need is to connect a button via 500 Ohm resistor between Parallel Port's ground (pins 18-25) and pin, whose number appears above the counter (for example pin 2 for Boring mill). You may set a name for a desired counter. Each counter remembers it's current number and will continue from this number, after a computer has been turned on next time. The counters will be able to process 20 counts per second and will programmatically prevent contact bounce consequences. * May be placed everywhere on the screen. * May be hidden or shown by single mouse click on systray icon. * May be set to be always on top of other windows. * Has an option "Run automatically when windows starts". * If the counter is near the edge of the screen it gravitates to it. Requirements: Windows 2000/XP or later, Bidirectional Parallel Port. connect an LCD Module to your computer and display on it all the information you need). * Compatibility with Windows 9x and Windows 2000/XP. * Very simple and easy to use interface. Requirements: Windows 9x/2000/XP or later.